Determine the maximum load conditions, i.e., the maximum BTU's/hour to be removed. It is important to add heat gains from refrigeration equipment and the heat of compression. If these figures are not available, it is customary to add 25% to the load. Determine the incoming water temperature at the time of maximum load. Determine the outlet water temperature, which must be less than the condensing temperature of the refrigerant and can be found in the condensing unit manufacturer's data. If this value is not available, assume 10 °F above inlet temperature. 2. Determine the pressure drop available for the valve. The value should be selected to provide required maximum rated flow at a pressure drop that is acceptably low in comparison the pressure drop that is available from the system. The Supply Pressure is taken from the outlet of the pump providing the water or from the water supply pressure. Subtract the pressure drop in the Condenser at the rated water flow, usually available as part of the chiller specification. Subtract line losses due to fittings, long runs, strainers, etc., usually a low value between 2 and 5 PSI unless there are long runs, high line velocities or many fittings. 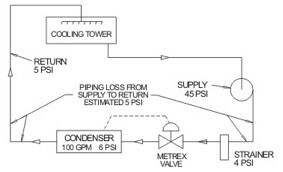 Subtract the Return Pressure in the line to the cooling tower from the same elevation as the Supply Pressure. The preceding sizing consideration is for "normal" applications. For applications having extreme operating conditions such as widely varying water temperature, unusual pressure differentials, etc., a Metrex application engineer should be consulted. It is important to avoid over-sizing valves. A properly selected valve is sized to be fully open or nearly fully open during conditions where maximum flow is required. Remember it is the valve's job to provide control by restricting the flow of water as required through a wide range of varying system conditions including load, condenser water temperature and available system pressure. Although Metrex valves are engineered to operate efficiently through the widest range of any valve of this type, control valves of this nature do not operate well at the extreme low end of their operating range if sized too large. Further, it should be noted that pilot valves require a minimum pressure drop to achieve proper operation. Consult individual Valve Data Sheets for a discussion of minimum requirements. Following these steps carefully will ensure optimal valve sizing resulting in dependable and efficient system control. If any questions arise in valve application or sizing, do not hesitate to contact one of our application engineers. Remember: it is our goal to provide "Set and Forget Reliability." In this example, the desired valve should have a Flow Coefficient of at least 23. The Metrex 2-1/2" 2-Way 800P Series with a Cv of 26 (slightly larger than required) will work well for this application.